The Sun Coast is an extraordinary place to go fishing and with our Sarasota fishing charter service, Captain Josh can put you on the fish you are looking for. From grouper to snapper...and even tarpon...our many natural ledges and an amazing artificial reef system provide natural habitats for a wide variety of fish species. We provide a full array of fishing gear and tackle chosen specifically to achieve the best results for the species of fish we are going after. 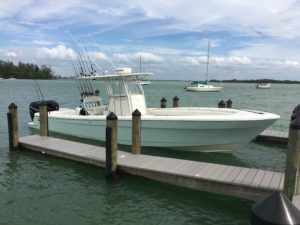 Our custom built Andros 32 Offshore is equipped with state of the art electronics, twin power, and is one of the best fishing platforms on the water. Comfort, speed, and safety are important when you're out on the water. The unsinkable hull, twin Mercury 4 stroke 300's, Simrad electronics, and the best fishing tackle will make your day fishing one to remember. Hogfish caught on an offshore fishing charter.